One of the biggest struggles I hear from compassionate shoppers is finding affordable makeup that is both cruelty-free and vegan. Yes, there is a difference between cosmetics labelled as cruelty-free and vegan. ‘Cruelty-free’ implies the ingredients and finished products were not tested on animals meanwhile ‘Vegan’ products do not contain any animal ingredients. There are some great cruelty-free drugstore brand lists and similar resources available online but not one specifically catered for only vegans. It’s probably because it’s a much shorter list but you may be surprised that although a brand isn’t considered 100% vegan, they do offer some options that are animal-free in addition to being cruelty-free of course! Here you will find a list of drugstore makeup brands that are either 100% vegan or brands that carry some vegan options as well as to how you can find those Vegan options. At the very bottom of this post, I also list drugstore makeup brands that are NOT cruelty-free and continue to test on animals and therefore should be avoided. Finally, I mention brands that are cruelty-free BUT not vegan-friendly and is probably best to avoid. But let’s start with the Cruelty-free brands that are either 100% vegan or offer some vegan options! Below is a list of cruelty-free drugstore makeup brands that do not test on animals with vegan options! NYX Cosmetics is cruelty-free however NYX is owned by L’Oreal, a parent company that does test on animals. Some of NYX makeup products are vegan, find a list of NYX vegan products here. Essence cosmetics is a popular drugstore makeup brand, they recently have confirmed a list of their makeup that are considered vegan, find a list of Essence vegan products here. Barry M is a great cruelty-free makeup brand for UK shoppers. Not all of their products are vegan but they clearly label which ones are on their website under each product description, or find a full list of Barry M vegan makeup here. Available in-store at Superdrug. Physicians Formula is widely available at most drugstores and they’re known for their dermatologist-tested, hypoallergenic, fragrance-free makeup. Find an updated list of Physicians Formula vegan products here. Available in stores at Ulta, London Drugs, Walmart. Models Own is a UK-based makeup brand with lots of vegan options. For a list of Models Own vegan makeup, find it here. Available in stores at Ulta. Ardell is a popular drugstore brand with a growing selection of cruelty-free and synthetic false lashes. Their lashes are made without animal-hair. Available in-store at most drugstores. Makeup Academy is cruelty-free and recently confirmed which of their affordable makeup is vegan, view a list of MUA’s vegan products here. theBalm offers some vegan makeup products for face, eyes, and lips. Find a list of theBalm vegan products here. theBalm is known for their talc-free and paraben-free formulations and retro packaging! Available in-stores at Rexall. All of Emani makeup products are vegan. Emani is known for the talc-free, paraben-free cosmetics that do not contain any harsh chemicals or petrochemicals. Available in-stores at Target and London Drugs. Makeup Revolution is an incredibly affordable makeup brand known for their eye and face palettes. Makeup Revolution recently added a VEGAN section on their website or you can find a list of Makeup Revolution vegan products here. Available in stores at Ulta and Superdrug. B. recently went through a major rebanding but they remain to be both a cruelty-free and vegan brand focusing on quality vegan makeup. You can find B. products at Superdrug. Available in-store at Superdrug. Avoid these brands as they continue to test on animals. Some makeup brands claim to be cruelty-free and do not test on animals however they may use ingredients derived from an animal. Common non-vegan ingredients used in cosmetics include honey, beeswax, milk protein, lanolin, and carmine. It is difficult to tell if an ingredient came from an animal or a vegan source just by reading a product’s ingredient list because manufacturers and companies are not required to disclose this on the label. However most vegan-friendly brands will usually tell shoppers which products or ingredients to avoid as they contain animal by-products. Unfortunately some cruelty-free brands choose not to disclose this information, as a result, I am unable to warrant any of their products as being vegan. Burt’s Bees – owned by Clorox (a company that does test on animals), uses milk, lanolin, honey, royal jelly and carmine in some products and claim that since many of their products are produced on shared lines, they don’t call them “vegan”. 3. Carmine: Obtained from carminic acid which is obtained by boiling cochineal beetles alive until they’re dead and liquid! Some methods of producing carmine dye include adding egg whites, fish glue or gelatine which are again animal sourced ingredients and are neither vegan nor cruelty-free!! Carmine is used in ALL bright red colored foods and makeup!! Sometimes the dye will not even show up as carmine, these companies will mask it up with complicated names like “E120” or Red xyz number! It is becoming frustratingly difficult and expensive to stay vegan! Heya! Yes, I’ve heard there may have been some non-vegan items listed on the Wet N Wild vegan product list… I’m not sure how often the list is updated so product formulations may have changed and the list can be inaccurate at times. But I haven’t heard any customers say anything about Jordana’s vegan list. I just want to mention a few things about the ingredients you noted..
1. Yes, as you said.. squalene can be derived from shark liver or from plants. Manufacturers are NOT required to disclose which source squalene was derived from so it’s always best to ask the company directly. In this case, I’m going to send an email to Jordana asking about the squalene in their blush. 2. Lanolin is a very common ingredient in cosmetics and skincare products. As you mentioned, any product that says it contains lanolin should NOT be considered vegan. 3. Manufacturers are actually required to label if a product may or may not contain carmine now because a lot of people are allergic to carmine so they have to clearly state it on their list of ingredients. Although, like you said, carmine can have multiple names .. almost all cosmetics sold in the US and Canada will also make sure to say “carmine” on the list in addition to using the scientific name for carmine. You may have also noticed carmine listed as an ingredient under “may contain”. This confuses a lot of customers because if carmine is listed under “may contain” it doesn’t necessarily mean that the product contains carmine. As I mentioned earlier, people who are allergic or sensitive to carmine cannot use any products that may have come in contact with the ingredient. So companies who manufacture multiple products on the same equipment or machinery will include carmine under “may contain” for those who are highly sensitive. Also, companies sometimes use the same label across multiple colors or shades of cosmetics… so only one shade of lipstick or eyeshadow may contain carmine whereas the other shades don’t and therefore are considered vegan. I just emailed Jordana because they put out a vegan list but when you look at the ingredients on the products most contain carmine so we will see what they say! Ok, so I love Rimmel London’s BB cream, but hearing that they are not cruelty free breaks my heart. Is there a lightweight BB cream brand you can recommend? I hate foundations, I’ve been using BB cream for about 5 years now. Elf cosmetics has parabens in them i could not possibly understand how they can be vegan. I though the whole purpose of being vegan to eradicate all products that are harmful to the human body. I understand where you’re coming from and the points you made. Yes, elf cosmetics are not natural by any means nor do they promote their products as being natural. Since there isn’t a standard definition for the term “vegan” — the label can mean something different to each of us. For me, living a vegan lifestyle means to buy and only support products that do not harm animals. So buying cosmetics that (1) do not test on animals and (2) do not contain any animal-derived ingredients is most important to me when it comes to defining a vegan lifestyle. 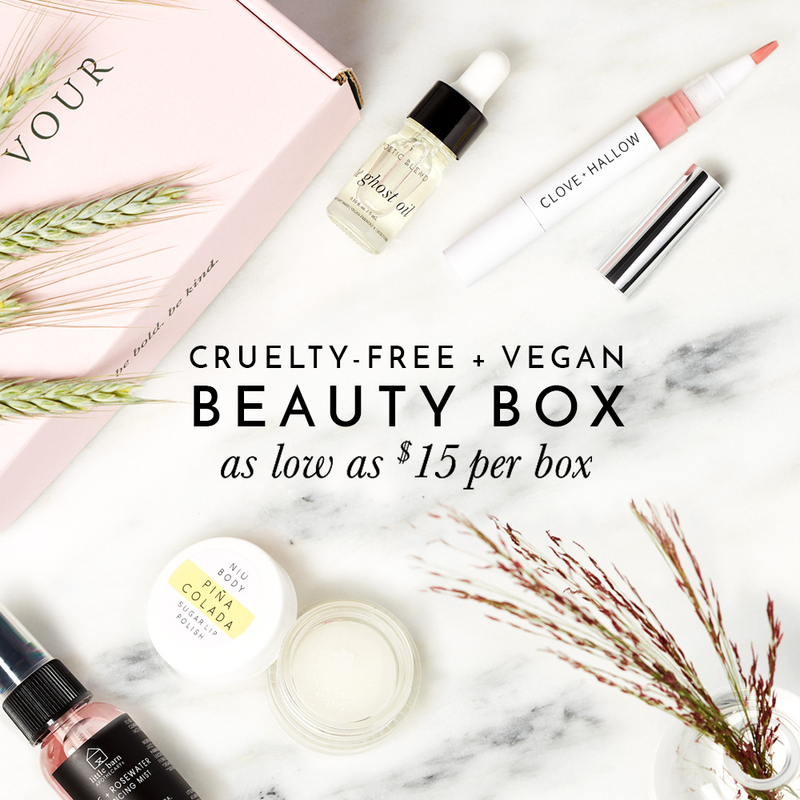 This list is to show consumers that cruelty-free and vegan cosmetics CAN be affordable. If natural products is a priority to you, then I also listed brands like Mineral Fusion, Pacifica, and PIXI that tend to contain more natural ingredients. Physician’s Formula is awful at replying. I asked them about their blush and they wouldn’t give me a straight answer. I had to harass them a second time specifically asking them to name any ingredients that are not vegan before they would answer me. I won’t support them anymore. They’re not interested in being transparent. Hi Vicky, my name is Sherami Ferando and I’m a vegan as well and I loovee your website. I find it super helpful and easy. But I did want to mention one thing, I researched the ingredients in Orly nailpolishs and I found that some of the older versions have pearl. Also, even the current polishes have guanine in it so the brand isn’t 100 vegan in the nailpolish section. I’m sorry if I’m just telling you somrthing you already know, I saw that you said that Orly’s “regular” nail polishes are vegan and I didn’t know what was considered regular or not but I thought I’d mention it anyways. But anyways, thanks so much for your helpful info. That’s very interesting.. I just sent them an email asking if any of their current nail polish contains guanine or pearl. I was originally told by ORLY that their nail polish are considered vegan so I’m not sure if this was a mistake on their part or they might have reformulated their nail polish since then! I heard back from ORLY and they told me that none of their nail polish including their cremes, shimmers, and sheer shades contain guanine or pearl. They also kindly sent me a list of their ingredients.. I checked it over and I don’t see guanine as an ingredient! YAY. They said that it’s possible you may be looking at an ORLY ingredient list from pre-2005. But rest assure, all ORLY current nail polishes do not contain any animal derived ingredients! “Are your products vegan? We do not claim vegan as some of our products may contain ingredients like beeswax, carmine and lactic acid (from milk). We recommend checking the ingredient listing of each product prior to purchase.” Seems like they saw either this post or some other similar one. I’ve send them a Facebook message regarding a product containing lactic acid. They’ll probably say it’s not vegan (the Touch of Glow Foundation), but I kinda hope it is. When I originally reached out to them a year ago, the girl I was speaking to seemed very helpful at first and said most of Physicians Formula products doesn’t contain animal derived ingredients and that I should read the ingredients to see if they’re suitable for vegans and to let her know if I had any questions. I went through all of my Physicians Formula products that I had bought and listed out a few ingredients that could be derived from animals or vegetable sources and when I asked if these were animal ingredients.. she stopped emailing me back! =( I tried to follow up with her and the company but no answer! That’s why I really hope they get back to you! Fingers crossed!! Just started looking into vegan and non-cruelty makeup options. I don’t always use makeup but decided that for the times I do I wanted something I was comfortable wearing. I never even considered cruelty free as something I should do because it’s not something that is promoted. It wasn’t until I saw JKissa on Instagram and started following her (she is a makeup artist who is AMAZING and just made the final switch to a cruelty free makeup artist) that I thought about it and how much it truly bothered me. So, here I am looking at all these different websites, and yours has stood out to me the most. Now you have inspired me to look into vegan options as well. 🙂 I have tried to stick to organic/ 100% natural brands for a long time since I have bad reactions to chemicals, but reading quite a few of your posts are making me look at more. So I guess in some ways this is a thank you for having the site and keeping it updated and getting a bunch of great info that I feel is actually useful. Aww, THANK YOU. =) thank you, thank you! Vegan for almost 2 full years and this is an amazing list Well done. As much as I want to try Kat Von D and other brands I simply cannot afford it. You have no idea how life-saving this list is! I’m a new vegan, and currently swapping out my cruelty and non-vegan make up. It is REALLY difficult to get any vegan products where I live, and again, some brands claim to vegan but not cruelty-free, vice versa. Thanks to your list, I can actually get ethical make up that is in line with my values! I spend hours today trying to find vegan and cruelty free make up & I end up feeling defeated with the confusion of the terms. Luckily, I have a nearby drugstore that sells GOSH. Will definitely look into it. Once again, thank you so much! Your blog is a lifesaver! Yay! I’m so happy to hear this came in handy for ya!! =) I know the feels girl, if only manufacturers could label their products to say this contains “crushed up bugs, fish liver oil, fat from slaughtered animals” That way it would make it super easy for everyone to avoid them!! I will admit that finding vegan products at the drugstore is a bit harder than say, shopping at Sephora! Because drugstores always carry well-known brands from Procter & Gamble, Johnson & Johnson, L’Oreal, etc who all tests on animals. But I’m sure the drugstores are realizing that vegan products are hot on the market now and therefore they’re carrying more and more cruelty-free brands!